Rachna was a senior manager in India’s banking industry for 18 years before moving to Canada in 2014. She took a month to settle in with her husband and two sons in Surrey, BC, and then she started the hard work of looking for work. Like most newcomers, she quickly discovered it would be a challenge to find a job with just international experience on her resumé. “When I started job searching, I realized how it would be quite challenging. But I said to myself, ‘I’m not going to just stay at home.’ I wanted to work,” she says. Rachna was doing some research at a Surrey Library branch when she saw a poster about National Volunteer Week, held annually in April in Canada. 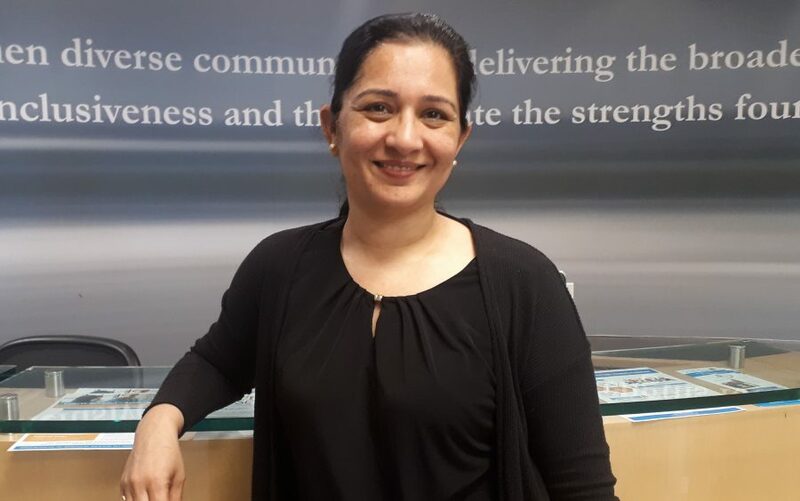 She also came across some news about DIVERSEcity Community Resources Society and its CEO, Neelam Sahota, who had just received a Women in Business Award – Not-for-profit Leader, from the Surrey Board of Trade. Rachna became a DIVERSEcity client, signing up for settlement program to help her integrate into the Canadian workplace. After a brief return to India, she came back to Canada in 2016 and once again came to DIVERSEcity’s doors, this time as a volunteer. She remembered that poster she saw about National Volunteer Week when she first arrived in Canada, and registered for DIVERSEcity’s Volunteer Program. She was accepted and began volunteering at the DIVERSEcity Community Campus on the reception desk. This experience led Rachna to her first job in Canada — a six-month maternity replacement as a program services officer for Community Airport Newcomers Network (CANN) at the Vancouver International Airport. She also did some freelance work for DIVERSEcity’s Interpretation and Translation Services, which is one of the largest interpretation and translation providers in the province. Rachna had the financial experience for the job and applied. With her professional background and her volunteer experience at DIVERSEcity, she easily got the job. She couldn’t have been happier to join the agency full time. Interested in volunteering with DIVERSEcity? Contact our volunteer coordinators at volunteer@dcrs.ca to find out about our next Volunteer Orientation Session.